​Uncompromisingly creating a bow with the beauty and craftsmanship of the Native American Indians is a challenging task. Using authentic methods and materials to create these artifacts, except where I cannot, while staying faithful to the spirit, design, and tradition of the original artisans is so rewarding. I learned to do this so I could help the public gain the experience of Native American culture vicariously through my interpretative practice. They might not otherwise have access to this knowledge of the indigenous culture. 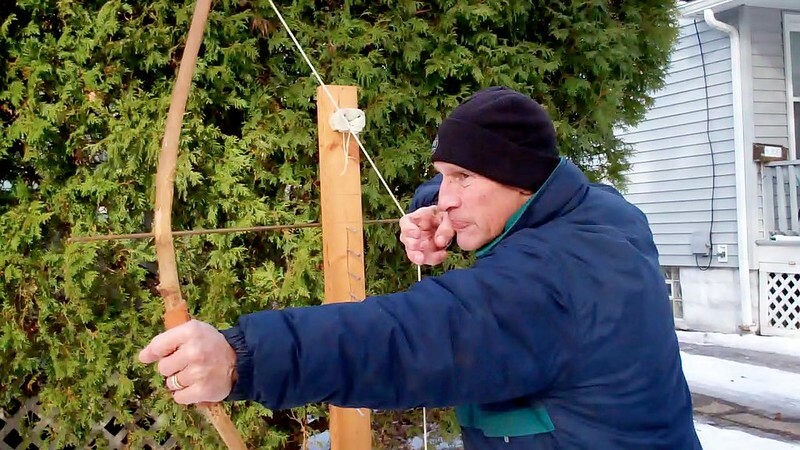 I learned everything I know about making the primitive bow and arrow from two sources. The first is a remarkable video created by John and Geri McPherson called “Naked into the Wilderness, Tape 3: The Primitive Bow & Arrow” (Prairie Wolf, 1992). I recommend this video to anyone who is interested in learning this skill. My second source is years of practice and trial and error. I broke dozens of potential bows in the basement of my house before I understood what John McPherson was talking about in the video and finally got it right. 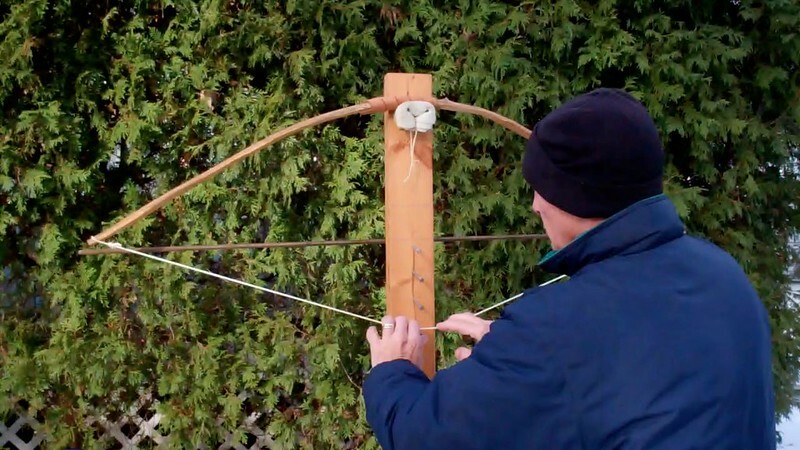 This blog focuses on making a primitive bow. I deal with the bowstring and primitive arrow in other blogs. I look for hardwood saplings. My favorite woods are sugar maple, hickory, and ash, but there are many others. I want saplings that are about five years old, one to two inches in diameter, as straight and free of knots as possible, and 50 inches long. Before the I “take” or harvest a sapling, I make sure that the mother tree is nearby. The mother tree will propagate more saplings and the forest won’t suffer from the loss of one sapling. I thank the sapling for giving up its young life for the benefit of everyone who is going to learn how the Native Americans survived and thrived. I take the sapling (now called a stave) home, debark it, and store it horizontally for a month to cure. When it’s ready for me to work it, I test for the natural bend in the wood. Common sense would dictate that I plan to bend the stave the way it naturally bends. Right? Wrong. I do just the opposite and plan to bend it in the opposite direction. Why? The final bow will be stronger that way. I remove wood from the “belly” of the stave, which is the side of the stave that is going to face the archer. I must remove wood only from the belly of the stave, not the other side, which I call the front and which is going to face away from the archer. If I were to remove wood from the front, the stave would break under the stress of bending it. It has to do with the physical properties of the wood. The indigenous artisan probably used a flint knife or scraper to remove the wood. I could, if I had enough time and patience, but I don’t. The original artisan lived to survive and devoted himself totally to these primitive crafts. I, on the other hand, have to check my e-mail every day, write this blog, go the grocery store, and so on. So I stray from the authentic technique and use a lightweight steel hatchet, which is a lot faster. I also resort to my steel sheath knife and scraper. I remove wood carefully because I don’t want to take off too much. I frequently test the stave to see how it is bending. 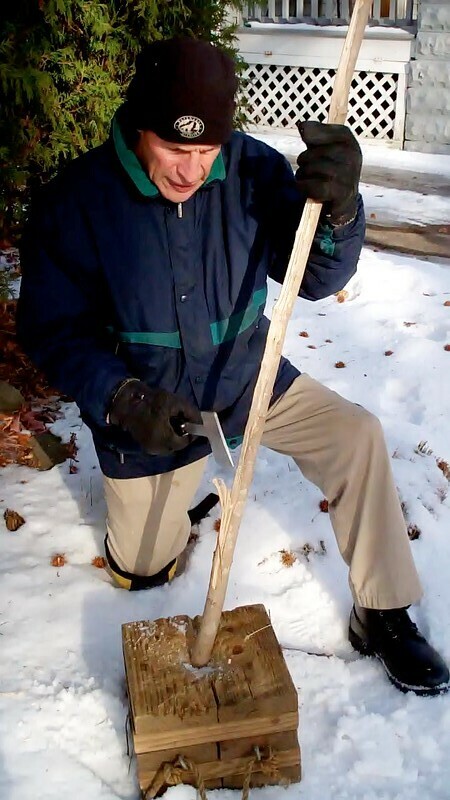 I do this by placing one end against the instep of my right foot (I’m right-handed), holding the other end with my left hand, and pressing down on the stave at the middle where the handle will be. With careful removal of wood and frequent testing, the stave will begin to bend. 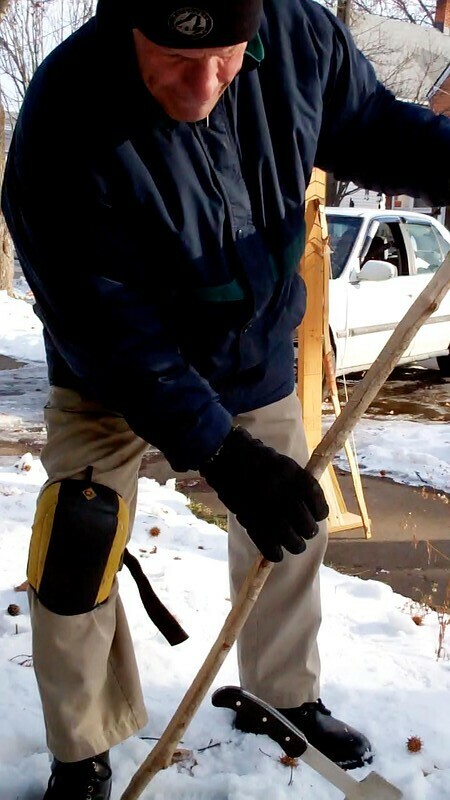 I remove the wood with patience and caution, mainly with my steel hatchet. I could easily overcut into the wood and ruin the stave. Testing it will tell. The stave is now at a critical stage. This is where I use the steel scraper. If the bow breaks under stress, it will emit a loud “Crack!” and I will emit a loud “Darn!” or something like that. As Job knew, patience is indicated. I remove wood along the entire length of the stave. I leave the wood somewhat thick at the handle. When properly done, the stave (now becoming a bow) will be about three eighths of an inch wide except at the ends, where it has to be thinner. That’s where “nocks” or notches go to accept the bowstring before I can take the next step. I use my sheath knife to cut the nocks because they are small cuts. John McPherson says the best bow is as wide and thin as possible. 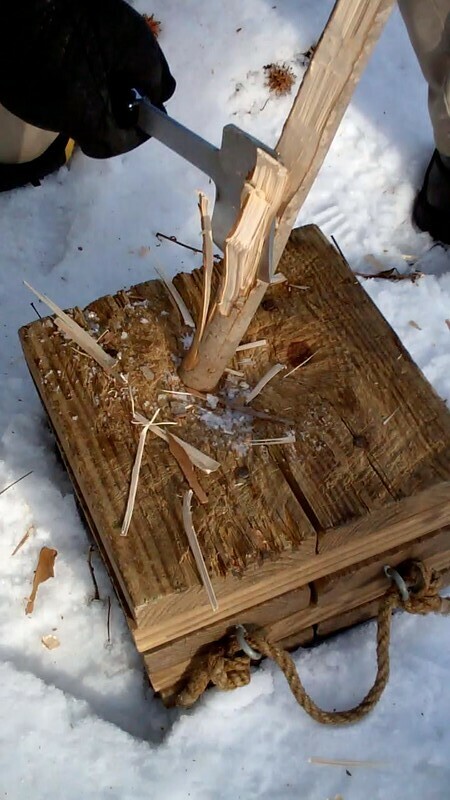 In order to get the bow to bend to the extent where I can draw it to cast an arrow, I put it up on a “tillering post.” John McPherson uses a tree for this. I built one when I saw it in a magazine about the primitive bow. It’s an upright 2X4 piece of lumber fixed to a base on small pieces of lumber. There are 20-pound common nails in the post every two inches down to 24 inches. Tillering is the process of getting the bow to bend equally on both the right and left sides of the handle. In order to begin, I work the bow until it bends enough that I can string it. 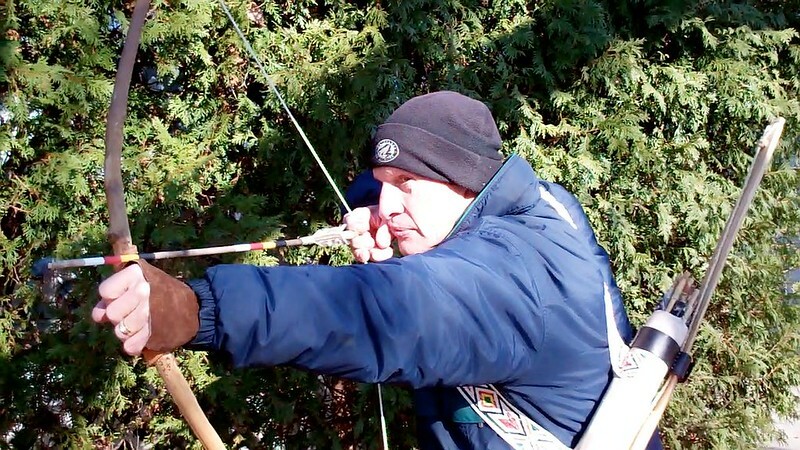 Stringing the bow means attaching a bowstring the nocks on one end, then bending the bow enough to attach the string to the nocks on the other end. I suspend the bow at the handle on a padded nail at the top of the post. Then I slowly and carefully pull the string at the middle down one nail at a time. I look to see how the wood behaves. Does it bend at all? Does it bend equally on both sides of the handle? If it does not do either very well or at all, the bow comes off the post and undergoes more removal of wood and further testing. In time, with careful trimming and testing, the bow must properly draw on the tillering post to 24 inches without breaking. At this point, the bow is essentially complete. The process of making the primitive as I’ve described it above takes a good deal of time. But anything worth doing well takes time. 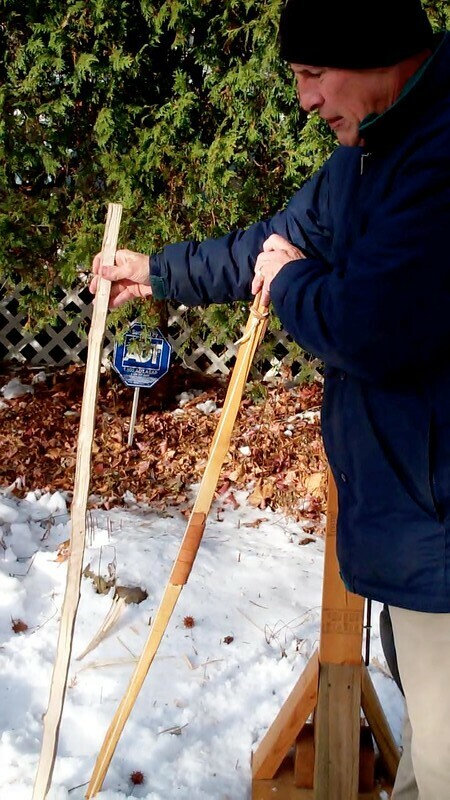 Another method of making the primitive bow that I have used in public is the “quickie” bow. I hold workshops at which I give people the materials they need to make the bow and walk them through the process. They also make an arrow and shoot it into a target that I provide. This entire process takes about four hours.